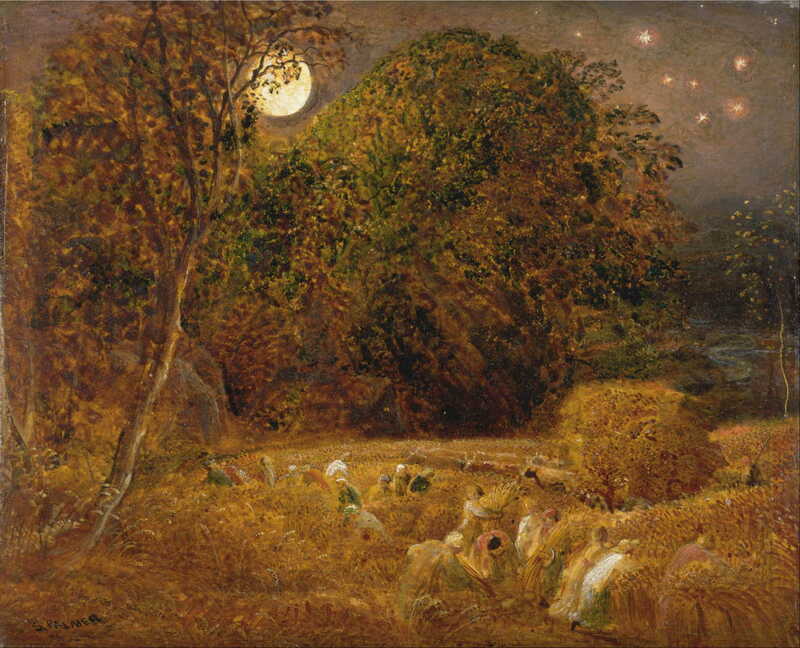 Samuel Palmer (1805-81) was one of the host of highly gifted British landscape painters of the early and mid-nineteenth century, alongside the much more famous JMW Turner and John Constable, whose lives and works have all but eclipsed those of Palmer and his contemporaries. This book is a monumental, meticulous, and insightful account of Palmer’s life and work. Written by William Vaughan, an emeritus Professor of the History of Art at Birkbeck College, London, it arose from his curation of the Palmer bicentennial exhibition at the British Museum in 2005, but has clearly been the labour of several decades. Part one traces the uncertain history of his childhood in London, and his family and relatives. Palmer was precocious: at the age of just 14 he had three paintings accepted for exhibition by the Royal Academy. Although this is remarkable by modern standards, it is worth noting that Turner’s work was first accepted at the age of 15, and that of Palmer’s mentor Linnell at 14. Vaughan examines the role of the Royal Academy at that time with great care, and shows the lack of linkage between exhibition at the Academy with success in an artist’s career. 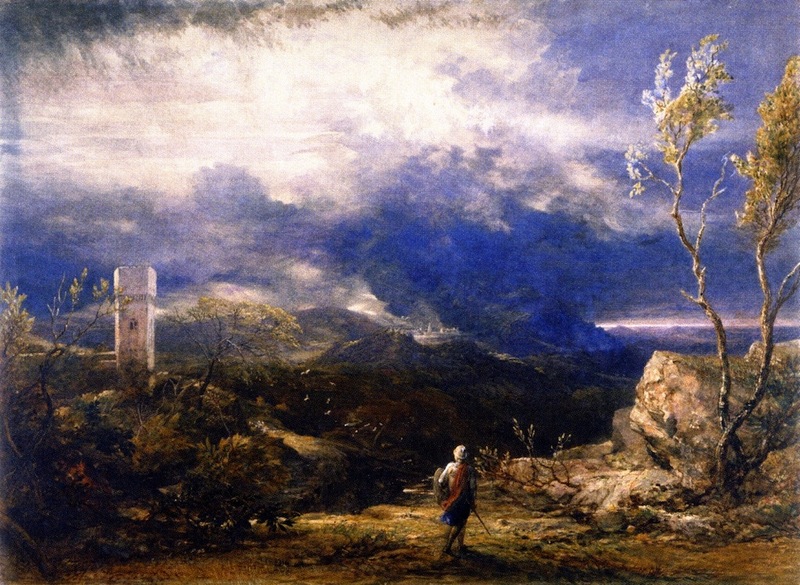 He considers the influence of Turner (at that time, the early Turner, not the later works for which he is today better known) and other contemporaries. These led to Palmer’s determination to avoid “the pit” of the Academy and contemporary art scene. Part two starts with Palmer’s discovery of the primitive, over the period 1822-6. 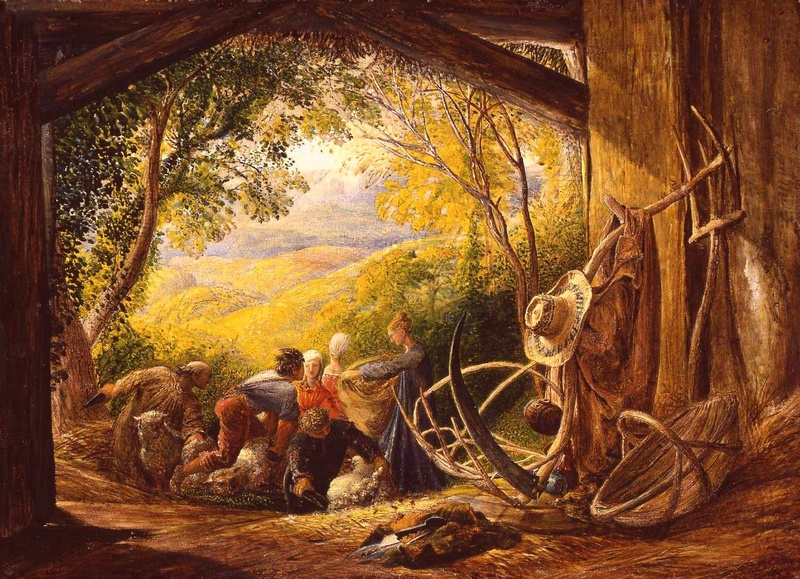 Palmer was 17, already a bright and promising student, when John Linnell (1792-1882), then aged 30, became his mentor. An experienced artist who had been trained by John Varley, Linnell was also to be his future father-in-law. Linnell painted realistically as a celebration of the divine, feeling that he had no need to emphasise or exaggerate as Palmer did. 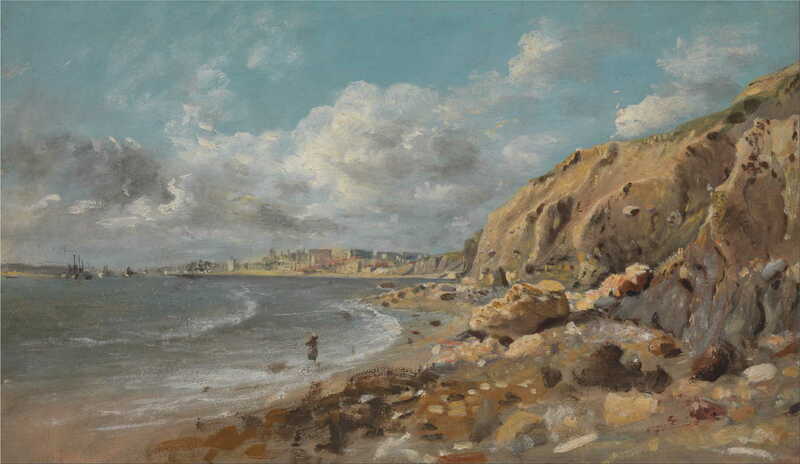 John Linnell, Coast Scene at Cullercoats near Whitley Bay (c 1834), oil on paper on board, 21.6 x 36.8 cm, Yale Center for British Art, New Haven, CT. Wikimedia Commons. Linnell introduced Palmer to the artists of the late Gothic and early Renaissance periods, including Dürer, and the fourteenth century muralists of the Campo Santo in Pisa, Italy. Vaughan also highlights the influence of Fuseli, and Palmer’s study of Old Master paintings at Dulwich College (as London’s National Gallery was not established until 1824). Palmer also viewed the private collection of ‘primitives’ kept by the Aders in London, which included a copy of a wing of the van Eyck Ghent altarpiece. However Palmer’s lack of conventional academic training left him with an unusual weakness in drawing figures. A sentinel event in Palmer’s development was his meeting with William Blake (1757-1827) in 1824. Blake was a visionary polymath who has only recently received the recognition that he deserves; at that time, he was “an obscure and impoverished figure” and generally thought to be just a “harmless madman”. William Blake, The Lovers’ Whirlwind, Francesca da Rimini and Paolo Malatesta (illustration for Dante, The Divine Comedy) (1824-7), watercolour, pen and ink, 37.4 x 53 cm, Birmingham Museum and Art Gallery, Birmingham. WikiArt. Vaughan examines the relationship between Blake and Palmer (mediated through Linnell) in detail, revealing the limited influence and common ground, emphasising that Palmer lacked insight into much of the broad genius of Blake. 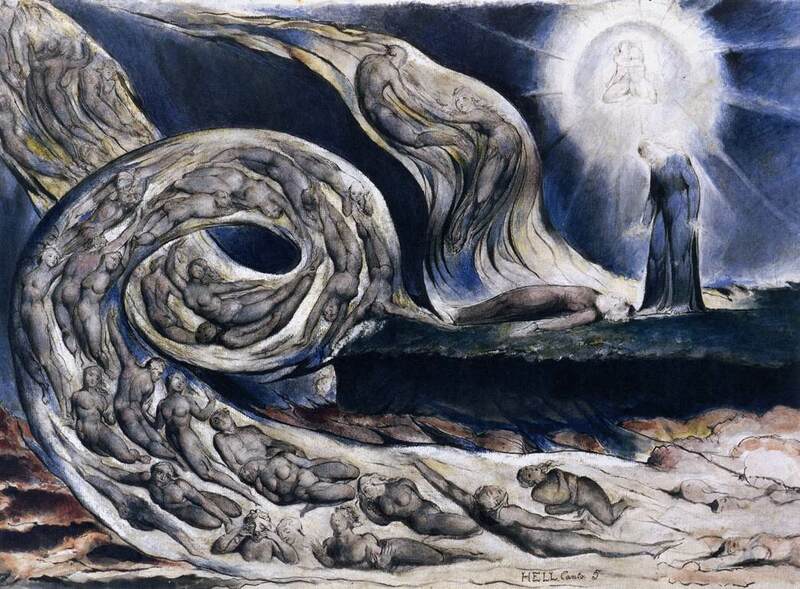 Palmer saw Blake’s figurative work as great intellectual and spiritual art, together with that of Michelangelo and Fuseli, and responded in some of his most successful work. Palmer’s approach therefore fits with that expounded by Paley in his Natural Theology (1802), as the basis of the common Romantic view. How three such artists with such different views of the world could apparently get on so well remains something of a mystery, particularly as they shared admiration for the paintings of Claude Lorrain. These conflicting ideas were reconciled, by Palmer at least, in his Shoreham work. Vaughan dubs the next period, 1824-35, Palmer’s visionary years. There is only limited evidence, such as Palmer’s almost complete 1824 notebook, and less than a handful of about forty works which Palmer exhibited in the period can now be securely identified. 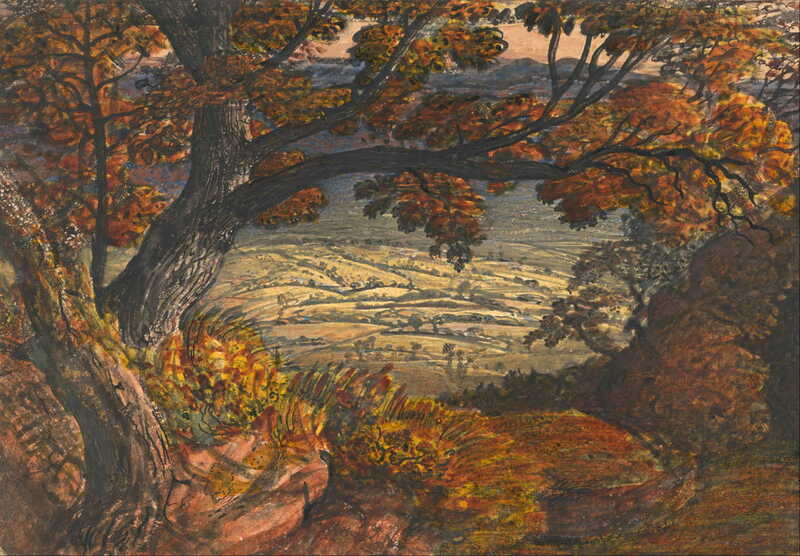 Vaughan starts with the change to Primitivism as inspired by Linnell, and most manifest in the Oxford Sepias, six sepia landscapes from 1825 which are now in the Ashmolean Museum, Oxford. There are excellent images of these dark and densely-worked paintings, and Vaughan discusses them first as a group, then individually. He concludes that they are pastorals depicting generic landscapes, possessing significant darkness (not just in their tone). In the same year that he painted those, Palmer inherited sufficient money so as not to have to worry about making a living for himself for some time to come. Palmer then joined an artistic brotherhood known as The Ancients, consisting of George Richmond, Edward Calvert, Frederick Tatham, Francis Oliver Finch, Henry Walter, and Welby Sherman. Of these only Palmer, Richmond and Calvert have left much of an impression, and today even they are relatively obscure. Surprisingly Linnell remained outside the circle, apparently considering it juvenile and whimsical. Unlike the later Pre-Raphaelite Brotherhood, The Ancients did not change the direction of British art. 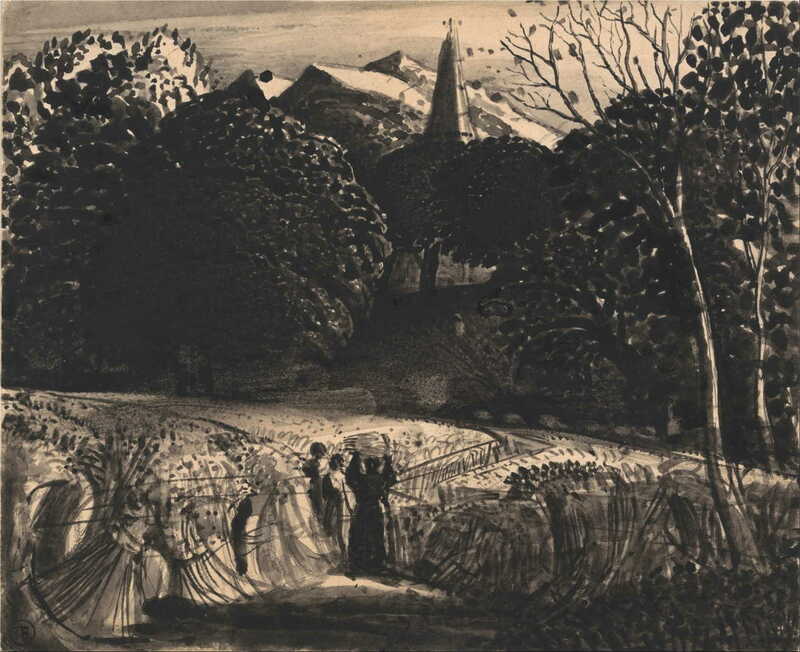 Part three examines Palmer’s achievements during his years in Shoreham, then a rural village in Kent, between 1826-35. At the time, artists seldom abandoned the city for the country, and it was not until the Barbizon School some years later that this became a recognised strategy among painters, unlike writers and poets. Vaughan gives us a vivid and detailed account of the village at that time, and how Palmer brought his vision of Beulah (the Biblical land of ‘milk and honey’) to Shoreham, and expressed this in his most celebrated works created there. Vaughan then examines some of Palmer’s works undertaken in Shoreham, including biblical scenes, studies of trees and buildings, and his exercises in the strangeness of twilight and the nocturnal. The latter paintings are perhaps his most impressive and memorable, with their weird combination of calm and magical foreboding. The period at Shoreham was not all rustic idyll, though. In the absence of a wife, far away from Blake (who died in 1827), Linnell, and The Ancients, and with strife in the rural economy and peasant protests, Palmer dabbled in local politics, then using another legacy to buy a property in Paddington, he moved back to London. His final works from the countryside were among his best, and were also successful at the Royal Academy, although this fell away from 1835. Part four follows Palmer in, and working from, his London base between 1835-61. 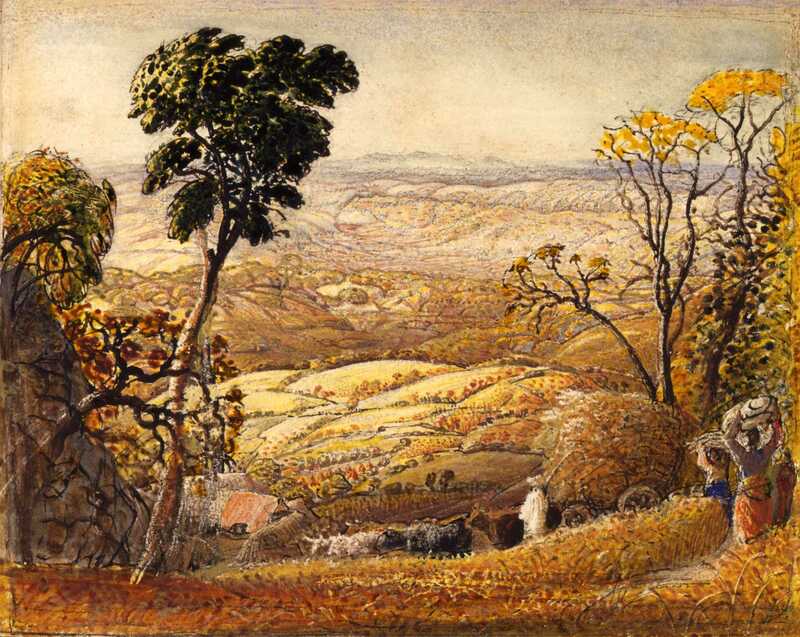 He had already travelled to Devon in the summer of 1834, where he started to paint topographical views. He was, though, far behind the leaders in that field (including Turner), who had long abandoned familiar locations in the south of England, and for some years had been producing views of continental Europe and beyond. Palmer sought more dramatic terrain in North Wales in 1835, resulting in his successful oil painting of Pistyll Mawddach, the waterfall near Dolgellau. He returned the following year, and completed dramatic studies of Snowdon from Moel Siabod and Conwy Castle in watercolour. Marriage in 1837 was followed by a visit to Italy between 1837-9, both of which have been declared damaging to Palmer’s art in other accounts. Vaughan is not so damning, but accepts that some of his work did become more laboured and conventional, the art of compromise. Palmer married his mentor’s oldest daughter, Anny, who was 19 at the time. Just a few days later, the young couple joined George Richmond, his wife and young son, and left London by paddle steamer for Calais. After a brief stay in Paris to admire Venetian art in the Louvre, they crossed the Alps to Milan, Florence, and reached Rome. They met Edward Lear, and Palmer obtained a commission to paint for banker John Baring. Vaughan shows us that the result was not up to the standard of his previous work, and its uncommissioned sequel A View of Ancient Rome (1838) was far better. The Palmers moved to Naples for a while, then returned via Tivoli to Rome, where they made small-scale copies of Raphael frescoes for father-in-law Linnell. They turned for home, travelling intermittently, and visiting Civitella, Papigno, and Florence, where they copied a Michelangelo in the Uffizi. Return to London in late 1839 posed Palmer the inevitable problem of how to generate the income which his family needed, and the solution lay in sinking into the same ‘pit’ which he had sought to avoid for so long. He still travelled, spending summers in Shoreham, Wales, and the West Country, and in 1843 was made an Associate of the Old Watercolour Society, which afforded him valuable professional recognition at last. A limited commission for four vignette illustrations for Dickens’ Pictures from Italy was helpful, but Vaughan tells us it did not lead to any more work. Vaughan depicts Palmer as accidentally becoming a watercolourist, which at that time was a distinct and restrictive line in painting. A fascinating but brief section considers Palmer’s techniques, which appear to have been as sophisticated as those of Turner or even later painters such as Winslow Homer or John Singer Sargent. His more ambitious watercolours, such as Christian Descending into the Valley of Humiliation (1848), competed in their effect with oils. In the late 1840s he also consciously sought a new style, in which capturing impressions of transient light and atmospheric effects became more important, and this helped him achieve full membership of the Old Watercolour Society in 1854. Success with his peers and critics still did not bring him the sales that he needed, though. Palmer even (in anticipation of relatively recent management tools, perhaps!) took to listing his strengths and weaknesses in his private writings. With the rise of the Pre-Raphaelites, critics saw Palmer’s chromatic boldness and new style as further indication of his strengths. Vaughan next explores the one aspect of Palmer’s career which did generate income to support his family: teaching, which he had started in 1832, let lapse, and returned to in 1843. Vaughan details this from the written notes of one of his pupils, which gives valuable insights into the methods of a popular and successful private painting tutor of the day. Vaughan writes that Palmer did not take up etching until 1849, but that it became a rare treat for him. Unlike Linnell, for whom print-making was a purely reproductive process, for Palmer etching quickly became another medium for expression. He was admitted to the Etching Club at a time when the revival of etching as art was starting. Although Palmer produced few etchings, and his early small prints were not a success, later and larger prints were exhibited at the Royal Academy. The final part deals with Palmer’s retreat and recovery, from the death of his elder son in 1861 to his own death in 1881. This he spent as a virtual recluse, living with his wife and remaining son at Redhill, Surrey. Vaughan does not take the surviving son’s account of these years at face value, but researches deeper. He considers Palmer’s account of Blake for Gilchrist’s 1863 biography, in which Palmer played down Blake’s subversiveness but viewed him as “a fitting companion for Dante” and a true genius. In his final couple of decades, Palmer assembled a display of art which was intended to protest against what he saw as the “degraded materialism which is destroying art”. He started a protracted project to illustrate Milton, which was completed shortly before his death. He also undertook a translation of Virgil’s Eclogues, and embarked on a scheme of ten or fifteen etchings to accompany that, but never completed them. 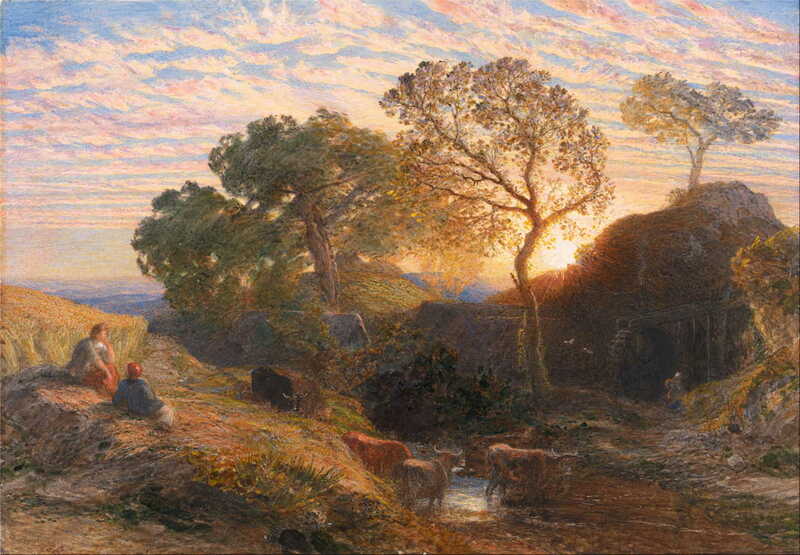 Meanwhile Palmer’s paintings returned to the pastoral, with deepening sunsets and distant isolated towers. He made two striking etchings, The Lonely Tower and The Bellman (both 1879), which Vaughan considers to be amongst his finest and most original. The first of these continues the theme of dusk and the isolated tower, and both return to the dark and densely-worked Oxford Sepias of over fifty years earlier. According to his son, Palmer was working on watercolour versions of both at the time of his death. If Palmer is now little-known, Vaughan makes it clear that his influence has grown prodigiously since his death. Graham Sutherland, Paul Nash, Eric Ravilious, John Piper, and even Maurice Sendak have admitted to the role that Palmer’s work has played in theirs. 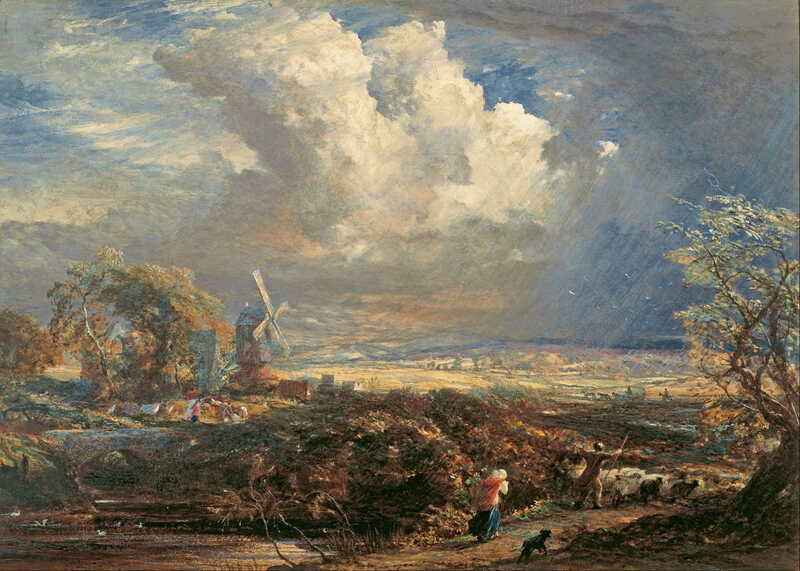 Kenneth Clark (an enthusiastic collector of Palmer’s work) wrote how Palmer had become almost too influential on more modern landscape painting. Vaughan rounds off with a delightful anecdotal tailpiece which brings the book to an appropriately enigmatic ending. There are extensive endnotes, in which the references are embedded, but a selected bibliography is also provided to aid further study. There is a single index which works well. The whole book is thoroughly and beautifully illustrated, although this is no attempt to embed a catalogue raisoné, and many of Palmer’s works are only shown in monochrome, or omitted altogether. Vaughan states that “good artists, I believe, endure despite the ebbs and flows of taste” and establishes his case for Palmer thoroughly and eloquently. This book should also endure as the definitive study of a great artist whose work deserves better coverage in galleries than is currently afforded. It merits a wide readership. Many of its paragraphs contain deep insights into important matters which are germane to nineteenth century art, and to art more generally. An immediate example is the distinction between Blake, Linnell and Palmer with respect to the role of the material world in their artistic vision, which I mentioned above, and can readily be generalised beyond that trio. Although no part is difficult to read or comprehend, much of it deserves slow and considered reading to appreciate its richness, and Vaughan’s wealth of understanding. This is a book to enjoy, and to return to – frequently – for its wisdom. Wilton A & Lyles A (1993) British Watercolours 1750-1880, Prestel. ISBN 978 3 791 34539 0. The most comprehensive collection (over 300 paintings) of watercolours of the period, which includes many examples of the work of Palmer, Blake, Linnell, and many of the other painters mentioned in Vaughan’s book. Posted in General, Painting and tagged Blake, Constable, Dürer, etching, Fuseli, Linnell, Nash, painting, Palmer, Piper, Ravilious, Richmond, Romanticism, Sendak, Sutherland, Turner, watercolour. Bookmark the permalink. Q&A: How much free space on a hard disk?